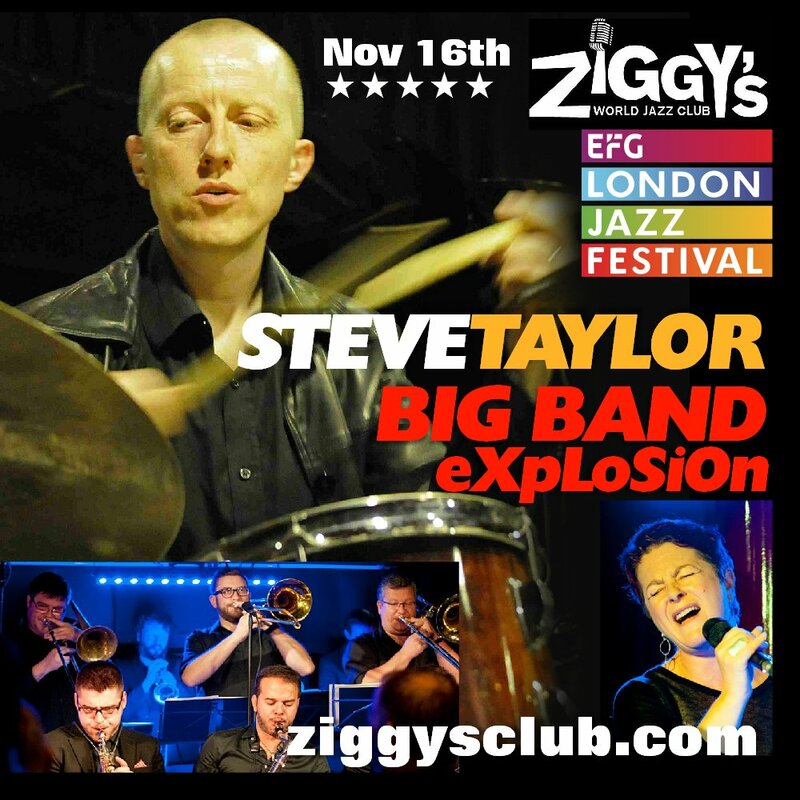 Ziggy's London Jazz Festival Opening night launches powerhouse drummer Steve Taylor and the Big Band eXpLoSiOn New Album "HITS" performing Steve's favourite music & songs with the Big Band eXpLoSiOn's trademark style. Steve Taylor Big Band eXpLoSiOn always deliver, being acknowledged by fans and critics alike as one of the most exciting British jazz groups on the music scene; wowing audiences at Ronnie Scottís Jazz club, Pizza Express Jazz Club and Ziggy's to name a few. Steve fuses his love of jazz, swing, rock and World Music to perform, high-energy material that expresses both tenderness and power in the same instant. Expect musical fireworks & Steveís deftly crafted arrangements of Al Jarreau, Gil Scott-Heron, Quincy Jones, Buddy Rich, George Benson plus icing the cake with brand new original tracks & special guests.